In the late 1920's the Soviet High Command believed their biggest military threat came from their neighbour Poland. They had intelligence that they were rearming with modern French and British tanks. The Russians decided they too need more modern tanks as they only had a few captured WW1 tanks from the Civil War and the T-18 light tank that was based on the French WW1 Renault FT tank. Surviving WW2 Red Army T-26 twin-turret Light Tank model 1931. Notice the shell holes in the right turret. A delegation was sent to Vickers in England. A deal was done on 28th May 1930where they were sold 15 Vickers 6-ton Model A (twin turret) light tank that was based on their Vickers Mark E export tank chassis. Other tanks were also purchased at the same time. 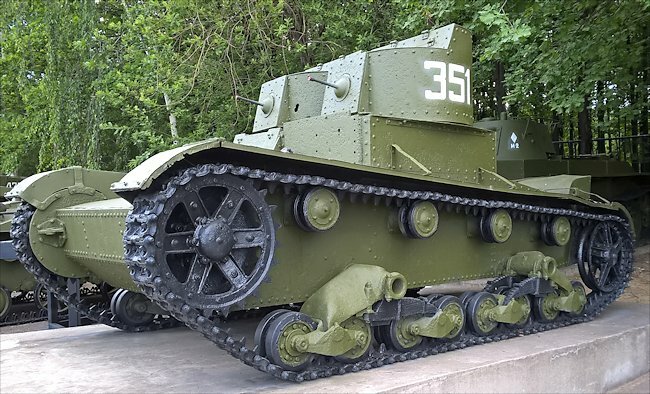 The Russians designated this British designed tank the T-26. It officially entered Soviet Army service on 13th February 1931. 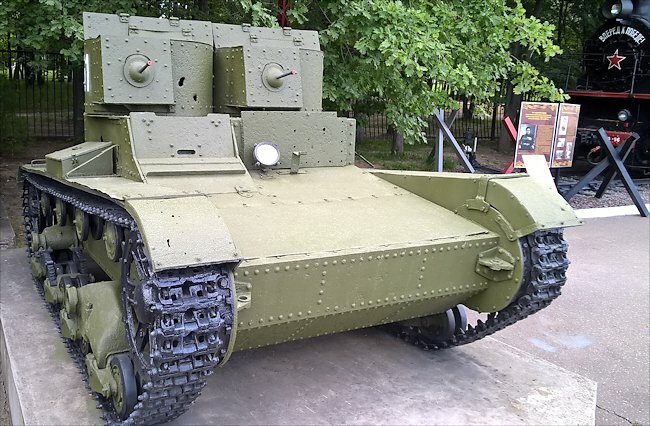 The Russians copied the Vickers 6 ton tank design and made a few changes. One of the reasons it was chosen over competing designs was because it was suited for mass production as it was relatively cheap and easy to build. The 1931 model of the twin turreted T-26 had higher turrets with observation slits, than the original British version of the tank. The Russian turrets had a round firing port for the two 7.62mm DT tank machine gun, as opposed to the rectangular ports used by the original British design for their Vickers machine gun. The twin turrets were mounted on ball bearings and enabled each turret to have a 240° arch of fire to the front, side and back. the tanks armour was only 13-15 mm. This was enough to protect the crew from light machine gun fire but nor tank or artillery fire. They did not have a radio fitted. Communication was by shouting, signal lamps or flags. They were manufactured at the Voroshilov Factory No. 174 named after K.E. Voroshilov. In the first year of production 100 twin turreted T-26 tanks were produced in 1931. The following year 1932 saw the largest number made; 1,361 came off the production line. in 1933 only 576 were made and the last one was produced in 1934. In total 2,038 twin turreted T-26 tanks were used. Around 450 of the 1932 twin-turreted T-26 tanks had a Hotckiss PS-1 37mm cannon fitted in the right turrets in place of the original machine gun. This tank can be found at the Central Museum of the Great Patriotic War 1941 - 1945 in Moscow, Russia. It was issued to the 115th Rifle Division. It was dragged up from the river bottom on the site of river crossing at Nevsky Pyatachok in July 1989 by the Katran diving club. The tank was restored at the Parnu Training Tank Regiment of the Leningrad Military District. It was donated to the museum in February 1998. There are only two twin turreted T-26 Model 1931 tanks preserved at the present time. Where can I find other surviving T-26 tanks?